EPUB is a standard format for reflowable e-books. Naturally, le-tex creates EPUB data from its typesetting workflow. For existing data resources, le-tex generates EPUB data by converting typesetting data (InDesign, Quark XPress, TeX, XML), as well as PDF, PostScript, or HTML data. Further details, in particular a discussion of different InDesign workflows for EPUB generation, can be found in the E-books section. As a member of the International Digital Publishing Forum (IDPF), le-tex plays an active role in the further development of the EPUB standard. The new EPUB3 standard supports features such as multimedia, interactivity, and MathML. Apple iBooks already supports some of the new technologies, like audio synchronization of texts with text-to-speech function (see “Example of EPUB with audio overlay”). Equally commercially relevant is the Kindle/Mobipocket format from Amazon. Amazon accepts EPUB as input, but not every EPUB construct can be converted to Kindle compatibility due to the significant limitations of this format. 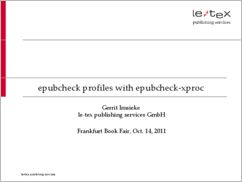 Our free epubcheck extensions allow EPUBs to be checked for Kindle compatibility. They can also be used to check compatibility of EPUBs with Apple's proprietary fixed-layout extensions.